At Niagara Inflatables and Games, safety is our first priority. In Ontario, did you know that inflatables are governed by the Technical Standards and Safety Authority (TSSA)? Any inflatable used at a public event must be TSSA licensed, set up by a TSSA trained mechanic employed by a TSSA certified company with TSSA mechanics on staff. Yes, it is quite a mouthful, but at Niagara Inflatables and Games, we take this very seriously. Public event is any event held by a municipality, festival, corporate, church, school or even a private party held at a public venue or having more than 100 guests. It is easy to hire a company that does not know of TSSA rules, and that can put you at risk of liabilty in the case of an accident. Protect yourself as an event planner and protect your guests by taking the time to be sure a company is TSSA certified with TSSA licensed units. Ask to see their TSSA licence, be sure it is up to date, and most important, ask to see the TSSA certificate for each inflatable you wish to rent. 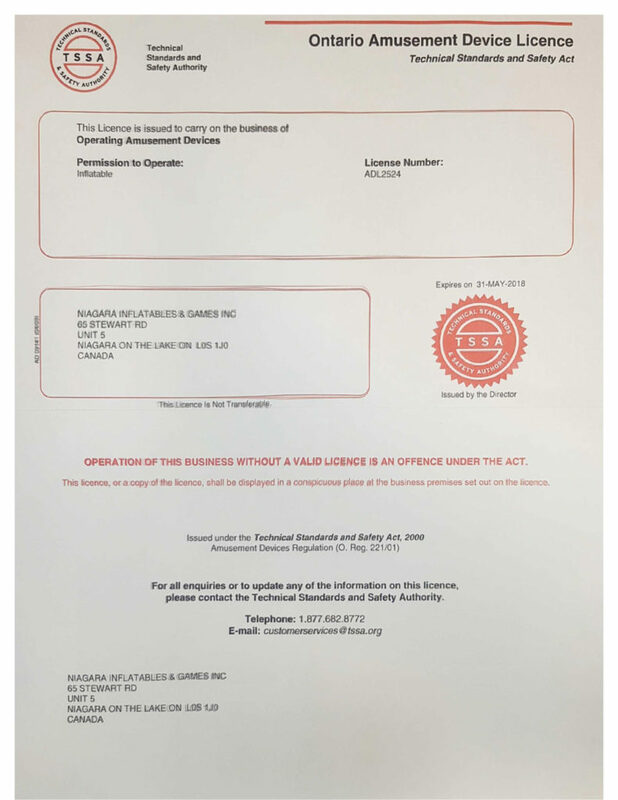 They will look like our license and certificate below. If you have any questions on TSSA, you can TSSA toll free at 1-877-682-TSSA (8772), or give us a quick call and we would be happy to answer any questions. We carry 5 million dollars in liability insurance for your protection.